Unless otherwise noted, these workshops are held at the San Francisco Center for the Book. You can register on the webpage for each individual class, linked to in each listing, or call the Center at 415-565-0545. I also offer a wide range of private tutoring in special topics; please inquire if you have a specific area of interest. Past lessons have included boxmaking, tooling, book conservation and basic paper repair techniques, edge gilding, photo albums and portfolios, and more. My full contact info is listed here. This class is for the true book lover. If you have ever had a beloved book that needed a new cover due to wear, or if you simply wanted to adorn it with a lovely decorated paper, this class will give you the tools and knowledge on how to do so. We will only partially disassemble the textblock, leaving the sewing intact and leaving the possibility to save the original covers bound in with the text. Then we will use decorative paper and cloth to create a made endsheet and full cloth covers, with emphasis on creating a harmonious whole. The reading experience is always enhanced when care is taken with the binding, so this is a reward for your positive reading habit. Since 2014, the San Francisco Center for the Book has offered the set of Bookbinding Core classes in an easy to digest series of five consecutive days. In these five days, you will make four books in ascending level of difficulty. You will learn about grain direction, using a board shear and a manual guillotine, how to use a job backer and how to set up a sewing frame, how to distinguish between the different adhesives used in bookbinding and why to choose them, and more. As of late 2018, we have graduated over 100 students in this core certificate program, readying students for a life of happy adventures in bookbinding! Come join us! It is impossible to imagine the history of bookbinding without leatherwork, and difficult to advance in learning bookbinding without having some skill or understanding of how leather is used in making books. Fancy books, plain ones, rustic or refined, historical and modern all have used leather in some fashion. Even many books without the tiniest scrap of leather still have borrowed working methods from leather bookbinding. This introduction to the advanced track in leatherwork for bookbinding helps students cross the frontier of those remote and mysterious tools and techniques commonly used in leather bookbinding today. The first half of the class will explain and demonstrate the technical aspects of knives, and you will experience how to get and maintain a great edge. We will look at the various advantages and disadvantages of PSA abrasive sheets, Japanese water stones, oil stones, and stropping compounds. We will also explain the different surfaces available for using your knife, and how they act on knives: litho stones, marble, and tempered glass. If you have a knife for leather working that has dulled or lost its shape, and you’d like to learn how to tune it up yourself, please bring it to work on. The second half of the class will focus on the various methods used to pare leather: edge paring with knives, and all-over paring with a Schärf-Fix or Brockman paring machine. There will be plenty of time for guided practice on your own in order to gain confidence with this essential skill. For those who learn quickly, paring for onlays and labels will be covered. This workshop is a requirement for the advanced leather track in bookbinding at the San Francisco Center for the Book. *Watch a video about this workshop! Sunday, June 30, 9:30-5:30. Register/more info or call 415-565-0545. Making a book with leather is always a reason for excitement. There is a little more work involved, but when you’ve carried out all the steps prior to covering with attention and intention, the experience of covering a book in leather is like no other. The result is also like no other. In this class we sew a book on raised cords, using handmade paper for endsheets and goatskin leather on the spine. We will practice all the skills we’ve accumulated in sewing textblocks and endbands, rounding and backing, lining the spine, and cutting board, and add what is needed to cover the book with leather on the spine and paper on the boards. This book structure takes the skills students learned in Bookbinding Core 4 :: Classic Rounded Back Cloth Binding, raises the bar and bridges the gap between cloth and leather binding with exquisite results. 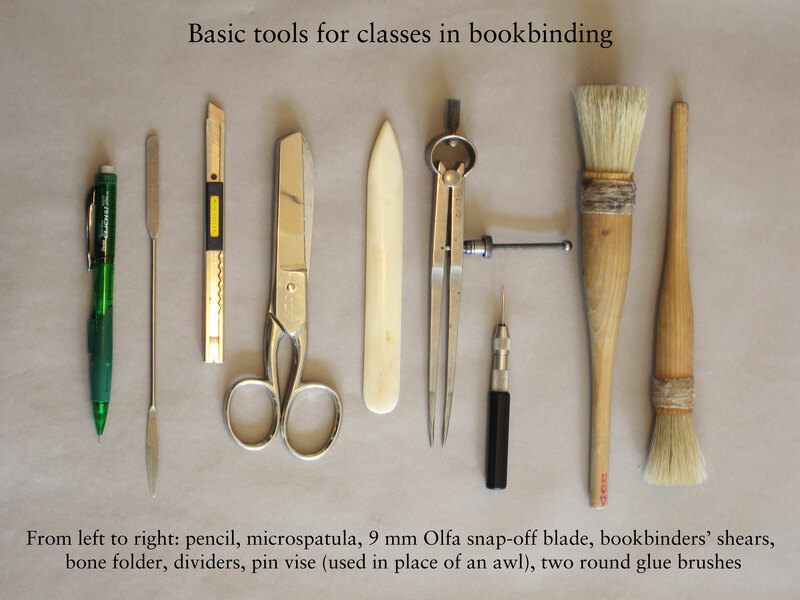 Ideally this class is intended for students who have completed SFCB’s bookbinding core and the one-day Orientation to Leather class, though if you have other bookbinding experience that you believe is equivalent, please don’t hesitate to contact us. PLEASE TAKE HEED! This is part of a sequential series of classes which follows Orientation to Leather. If you have not taken Orientation to Leather, you must do so before you can register, participate in, and enjoy this class. You must also take Orientation to Leather in order to receive the leatherworking tool you will need for Leather Core 1. Hey you, finicky readers out there! Tired of having to wrestle with your beloved books as you read them? This class is for you. In this workshop, we will take a paperback book and transform it into something more durable and easier to flex and open. We will reuse the old covers and spines, creating a recessed area in the new hard covers to place the old ones. This is also one of the most common bindings for books in single sheets, so it is a technique you’ll be able to use for other types of projects as well. Please note that we will be rebinding books provided by the instructor, so you can perfect the techniques before improving on your own personal treasures. Here is an article one of my students wrote about his experiences in the Week-Long Core.